After creating a horizon, all changes are tracked. This includes picking, erasing, and any horizon operations. Undo changes: Remove the most recent change. Redo changes: Repeat changes removed by an undo. 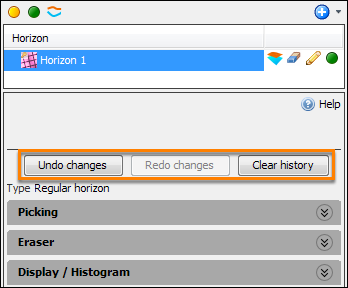 Clear History: Clear history finalises changes and removes revision history for that horizon. After clearing the history, you will be unable to undo changes made before this point. This affects all users of the horizon. Tip: After manually picking a horizon for several days, consider using Clear History. The revision history can result in manually picked horizons becoming large and inefficient.